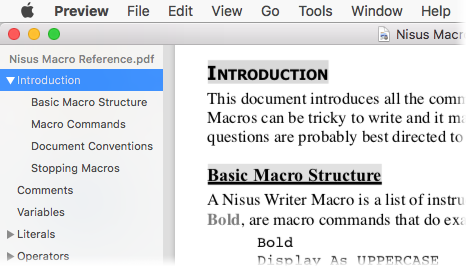 Heading paragraph styles can automatically include your document text in the Table of Contents (TOC). When you're done writing, insert a fully complete and automatically generated TOC. 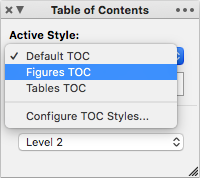 Browse all TOC entries in your document live during editing using our navigator sidebar and quickly jump to corresponding document headings. Drag and drop TOC entries in the navigator to rearrange corresponding document content. Insert a generated TOC inline in your document text, where TOC entries are clickable links that jump to their respective document heading. TOC metadata usable by PDF software for navigation or other purposes. Formatting for each generated TOC entry level. Leader tab markings like dots, lines, or dashes. Whether or not to include page numbers. Read more in our user guide's help topic about Table of Contents.